This unit is amazing! 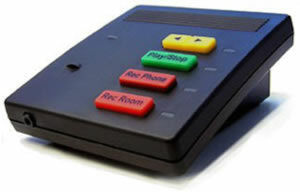 The manufacturers of this digital phone recorder were the first to do it connecting to a computer using a USB cable, so they simply called it "USB Recorder". It's a powerful little hardware & software combination that connects your phone and your computer, allowing you to record phone calls automatically or manually. You can even use it to record conversations in the room with its built-in microphone. Calls are saved directly to your computer's hard drive and can be accessed using a username and password for security. Files can be easily accessed using the USB Recorder software and can be e-mailed or burned to CD for archival purposes. Your messages can be saved on your local PC, saved across the network or even to a FTP location you specify in the software. The USB Recorder works with ANY phone, regardless of phone system, digital or analog. You can use it for small office / home office applications, or at the office with your existing business phone system. PBX or Centrex - no problem. Because it goes between the phone and the computer, there's no effect on your phone's business functions. If you're purchasing this equipment, visit here for installation and download instructions. Two options are available - the base model (codenamed "Primo") is just the USB Recorder. The USB Recorder PRO (codenamed "Sparky" - shown to the right) features a built-in headset jack (and headset) and allows you to play back phone messages over the phone. Very useful to remind people what they said. Click here for more information. Easy to set up - no technical knowledge required! Built-in microphone - record conversations in person! Can save files to local computer, across LAN or to FTP location.